Drug dealer Narco Alcos who once magically escaped from imprisonment in Dasmarinas, Cavite was re-arrested at Naga City in Camarines Sur. He was last found seeking refuge in Naga City -- a city that was once under the rule of the late Jesse Robredo. He was found hiding in the house of the Villafuertes, a relative of the Robredos. The hunt launched by Justice Secretary Menardo Guevarra was cut short when PNP in Naga City caught Alcos in a house owned by the Villafuertes. Alcos was last seen trying to resist arrest but he was re-arrested. However, the absence of Atty. Romulo Macalinlang made his puff of smoke escape impossible. He was arrested with the help of Chinese, Indian and Japanese magicians who agreed to help the Philippine Department of Justice. "The arrest order against Alcos wasn't easy. 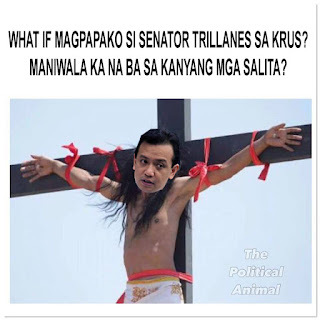 The fact that he could escape prison in Dasmarinas, Cavite is unthinkable. We have prepared a magic-proof cell prison where there can be no Wi-Fi or Internet for Alcos. We have traced all the magical energies to Atty. Macalinlang. This time, we have put wards that will prevent any more magic from helping Alcos escape." said Justice Secretary Guevarra. It was later discovered that former justice secretary Vitaliano Aguirre Jr. did destroy some documents prior to resignation. It were videos of Alcos trolling him across social media. Aguirre later admitted that he lost track of his duty spending too much time arguing with Alcos on Twitter. Later, Alcos was seen in a PNP Custodial Center in Camarines Sur where amulets against magic are hang in his prison cell. Meanwhile, preparations for Alcos' trial for drug-related charges are to follow. Others who are in the PNP drug list associated with Alcos are Mondodo Kane, Rich Hindi Mahusay, Rommel Dumbzone, Khrisanto Magtanga, Rhian Duwagtera, Jim Bastos, Michael Boo Laglagsabal, Ogag Lim, Nelson Abo Nakaalis Pasukin, Rowena Villaboba Reyes, Ninny Clama, Cynthia Patatas, Emy Deviles and Alexander Natigbak to name the next PNP manhunts. Future hunts for his comrades will soon be implemented.